Historic Shed was contacted by a couple who live in the Hyde Park historic district in Tampa to design a garage and guest room for a very unusual lot. Triangular in shape, their small lot was just over 4,500 sf and contained a lovely one-story Craftsman bungalow with less than 1,000 sf. The atypical lot was further constrained by a large protected oak tree on the site, and one on a neighbor’s lot, just over the property line. With Tampa’s strong tree protection ordinances, this left little space to build. Building up was the only real option to maximize the remaining lot space. Before: The site once had a one-story one-car garage on the lot, long since gone. The original concrete was still in place, complete with a 1919 date embossed. A ramshackle carport had been constructed by a previous owner. The Main House: The historic bungalow on the site has a 3:12 roof pitch and 4′ bead board eaves with bracket supports. After tweaking the design to fit the lot and meeting with Tampa’s Historic Preservation Office and Forestry Department, the resulting project created a 12’x20′ one-car garage with apartment above. A 6’x8′ one-story shed allowed additional storage while accommodating the lot’s shape and giving a visual step down from the two-story volume to the street. The stairs were placed at the rear of the building for privacy with an exterior design that allowed them to encroach within the required oak tree setback. Due to height constraints at the Historic Shed shop, the first and second floors were prefabricated separately. Installation of the Garage Apartment adjacent to the historic Hyde Park bungalow. Installation of the prefabricated outbuilding. Trusses installed, roof sheathing on, and the shed addition in place on the right side. The garage design itself took its cues from the main house which had a low-sloped front-gable roof and very wide eaves. Walls were clad in lap siding and an existing skirt board was inspiration for a belt course on the new building. The new outbuilding was kept simpler in architectural detail, but clearly complementing the main residence. Windows and shed door installed. With no alley and an odd shaped lot, the garage faces the street and has the same front setback as the main house. The stairs to the second floor apartment are set to the rear of the building for privacy. The exterior wood framed stairs allowed the building to set closer to the protected tree on the site. Second floor interior view when you walk in the door. The floors are laminate, the ceiling is 1×6 V-groove pine, and the walls are drywall. A mini split ac system cools and heats the space. The main room in the second floor apartment. The space will double as a home office and guest suite. The French doors let in extra light. A 5′-6″x5′-6″ 3/4 bath is located on the right. View into the apartment bathroom. A steel overhead garage door with a carriage house overlay by CHI finishes out the front facade along with period-inspired lighting. The ribbon driveway completes the exterior of the garage apartment with a period look. The interior of the garage was finished in plywood fro added strength. The storage shed is located on the right. The 6’x8′ side storage shed features a cypress bead board door. The finished product, waiting for sod. A new deck creates a welcoming entry from the street. And the rear of the carriage house completed. See more about the Two-story Garage-apartment options. A two-car version is in the works as well. We would love to build your garage, but it would increase the cost to cover travel and lodging for the guys while they install it. Since the two-story units take a while to install, it would be weeks of lodging. This looks amazing. Do the plans include any concepts for a kitchen sink, cabinets, and small stove, refrigerator? Yes, this includes a full bath and kitchen. Would it be possible to put the staircase inside instead of out to have this as a free-standing home? Yes. You’d want living space on both levels? Just a small area of living space downstairs for entry from garage. I am currently looking for a narrow/small lot. Are you still around 200. a sq ft finished? It looks very historical. The roof pitch looks like airplane bungalow design. Is that 3/12 or 4/12 roof? Thank you! The roof has a 3:12 pitch to match the main house. I wonder about extending one of the rooflines down like a salt box over the second garage module. It should be economical of materials and would add good space and storage to the dwelling area. 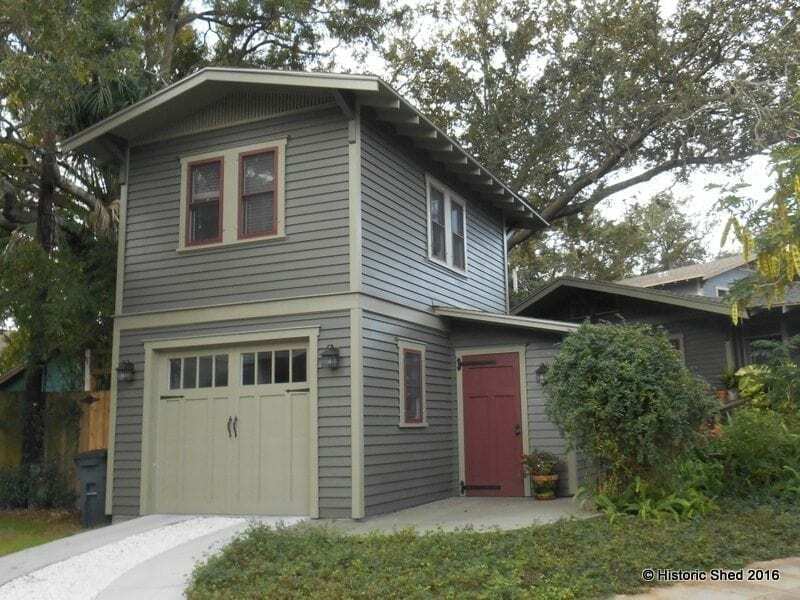 A metal roof would be a desirable look I too am looking for a two car garage apartment for Sarasota. I think that the saltbox design could be done fairly easily as opposed to the garage bump out. We are planning to build a two-story-garage apartment in Sarasota this Spring (it is in permitting now) so check back as we post updates. oops nevermind– i see that you’ve listed the breakdown elsewhere thank you! very curious about your budget on this project– looks GREAT! perfect starting point for my ideas, and no concept of how far outside my budget this might be. Do you have plans for purchase for the two car design? Really like this design. So glad you like the garage! Unfortunately, we do not offer our plans for sale at this time. excuse my error I should have typed ‘& the main room? The bath is 5′-6″x5′-6″. The main room is 11’x13′ interior wall to interior wall, plus the small entry foyer area. We have plans for a two-car garage apartment, as well as an oversized one-car garage apartment (16’x20′), but I have not finalized the construction details for the structure and have not built one yet. We have very little on display at our shop (one tiny shed and one 10’x10′, plus whatever is under construction at any given time), but if you send me an email, I can send you a list of places where our work can be seen in place. very nicely done! I love the mini house movement and this design and detailed finishing work is beautiful! Thank you very much. We strive for quality over quantity!